It’s not easy to find INFJs. They constitute less than three percent of the general public. But they’re very interesting because their traits look like they’re paradoxical. As an INFJ, I often think my personality is split into two. Let me tell you what life is like for an INFJ. Most of the time, I want to be around people. I want to befriend them and connect with them and just hang out with them all day, every day. This line of thought lasts for exactly five minutes before I want to hide myself away from the world for half a week while I rest and catch up on my reading. I want to be a hermit, living alone without ever having to speak to other people. 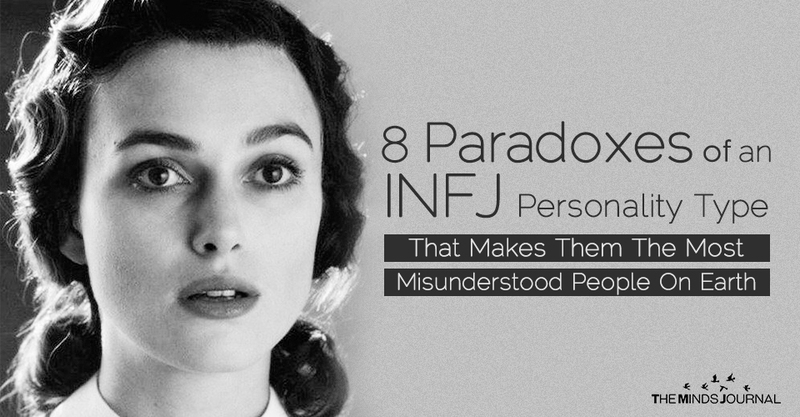 INFJs tend to be introverted and extroverted. They like isolation but simultaneously, they want to hang out with those they can have intense discussions with. This is why INFJs can be quite withdrawn while also outgoing at the same time. I feel great when I hang out with people. I love analyzing them and figuring out what makes them tick. But if I spend too much time with them, I feel drained and I need solitude. It’s both a blessing and a curse to feel the way INFJs do. They are blessed with the abilities of an empath and so, they feel exactly what the people around them do. I know that I can feel emotions very intensely. But at the same time, again because I’m an INFJ, I can also look very cool and collected to others. It doesn’t matter what is going on in my head, no one outside will get even the slightest hint of it. This isn’t always good for me because I tend to bottle up things without letting them go. But there have been instances when I succumbed to powerful feelings. The people around me think I have hypersensitivity then. The feelings of an INFJ run deep and it’s hard to know what they are thinking. INFJs are fascinated with all the different aspects of a man’s life and they tend to express their observations in a creative manner. But they also have a scientist inside because they are both intuitive and thoughtful. This makes them look to logic and rationale for their conclusions. They achieve great success as doctors and scientists but they are also artistic and can make great headway in professions that call for creativity. This makes them well loved both at work and outside. Even the way we see the world is full of contradictions. INFJs are great at analyzing people and their judgments are usually correct. It’s hard to hide things from them because they can see right through you. I actually worry about my mental stability at times because I can tell what people are going to do before they do it. This does have a flipside to it. People tend to commit cruel acts and this affects me intensely even if the act had nothing to do with me. I have to make an effort to see only the good and not lose my positivity. I do believe that we can save the world and ourselves if we only tried.